As part of the 2014 Qasr al Hosn Festival 2014, people celebrated Cavalia’s first performance in the Middle East, a spectacular show which featured 50 international performers and 50 horses. Cavalia at Qasr al Hosn, an innovative multi-disciplinary production created by Normand Latourelle, one of the co-founders of famed Cirque du Soleil, was performed in a series of shows from February 22 to March 1, 2014. 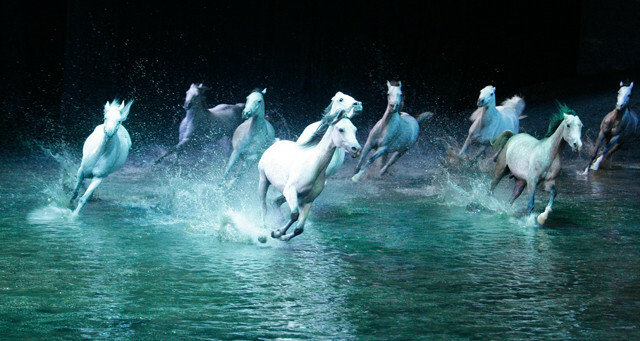 Enjoyed by over 4 million people across North America, Europe and Australia, Cavalia is a lavish production involving 50 magnificent horses and featuring 50 riders, aerialists, acrobats and musicians from all over the world. A show unlike any other, Cavalia at Qasr al Hosn celebrates the equestrian arts and the strong relationship between humans and horses. The show was specially adapted for the Qasr al Hosn Festival audience, and was the first show of its kind to be performed in the region.